Powered speaker with nice mixer section. 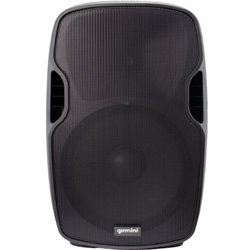 The Gemini AS-15P is a 2000W powered loudspeaker with a 15" woofer and 2" HF driver that is suitable for bands, DJs, permanent installations and other kinds of sound reinforcement applications. It is lightweight and powerful, and is priced to be within the means of most bands, venues and performers. In addition to its high power rating and clear, present sound, the AS-15P is equipped with a versatile mixer section that makes it a particularly useful piece of equipment. The AS-15P features a two-input miker section, each with its own discrete volume control. One channel features an XLR input, a 1/4" input and a volume control, and the other features XLR, 1/4", RCA and 3.5mm TRS. There is a two-band equalizer for the mix output, as well as an XLR mix output for daisy-chaining to other speakers.